Sheila’s Window Toppers & More Ltd. your Hunter Douglas Blind Dealer Store location for Calgary. Sheila’s has been a leader in Window Coverings serving the Calgary, and surrounding areas since 1991. You’ll find more than just great window coverings with us. We carry many top brands of blinds and shades including Hunter Douglas, Graber, Shade-O-Matic, Maxxmar and more, the leaders in window treatments of all kinds. Sheila & Loren, the owners, live in the Calgary North West Crowfoot area and they serve and have the knowledge and expertise to help you put it all together, from design to installation. As the owners they take pride in having their name associated with honesty and integrity and as a result much of their business is referral and repeat business. They own an Award Winning Company, being Awarded and named the Best Shutter and Blind Company in Calgary for outstanding customer service for three years running. A Calgary window covering family owned and operated company with our daughter Karen and son-in-law part of our expanding team. My name is SHEILA and I have been in business with my husband LOREN since 1991. Our ONE & ONLY Store Location is in Crowfoot N.W. There is public confusion in our industry and we want to make it clear who and where we are. IF YOU HAVE BEEN REFERRED AND ARE LOOKING FOR US WE ARE at 250 CROWFOOT CRES. N.W. To provide our customers with high quality window covering products, drapery and upholstery fabrics, custom furniture and other accessory decor items at a competitive and fair price. To provide our customers with the best service in the industry which will result in a positive, enjoyable & fulfilling shopping experience. To ensure the longevity of our company through repeat & referral business. This is achieved by customer satisfaction in areas of timeliness, education of products, attention to details, quality installations and service minded attitudes of owners and staff towards customers. We are very pleased with Sheila’s Window Topper’s service and installation of our Roman Roller Blinds and a Kitchen Roman Shade. The installation was a challenge requiring a 20ft ladder, careful measuring and then installing the electronically controlled Roller shades. Family and friends over the holidays were impressed by the functionality and appearance of the finished product. My husband and I built our dream home in Tuscany and we wanted to complete the look with top notch window coverings. We stumbled upon Sheila’s Window Topopers & More and we couldn’t be happier. Being new home builders we weren’t sure what products would best suit our needs but with the helpful advice from Sheila we received exactly the right products for us. From beginning to end the service was outstanding! We couldn’t have asked for more knowledgeable and courteous, professional advice, service and products. I have recommended Sheila’s Window Toppers to all of my friends and family and I will continue to recommend them to anyone that asks for a referral. Sheila’s Window Toppers stands behind the products they sell and in the end you feel like a friend not just a customer. Souk at Sheila’s Window Topper’s was fantastic to deal with! Very quick, efficient and knowledgeable. We were unhappy with the blinds that were put in our house when it was built so we called for an estimate on how much it would cost to replace them with something better, we were pleasantly surprised with the cost and had them replaced. Since budget was a concern as well as having a good product Souk went through all the options with us so we could make an informed decision on something new. The best part of all they were here extremely quick and they went above and beyond to have them installed right away! I would highly recommend Sheila’s Window Toppers and will be calling them again when we are ready to replace the next batch of blinds! 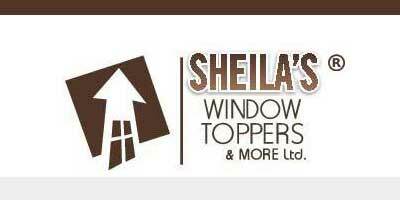 Sheila’s Window Toppers & More has been a Calgary area leader in window treatments, and window treatment automation systems since 1991. Stop by our Hunter Douglas Showcase location to see many functional window covering displays. The professional designers at Sheila’s Window Toppers are committed to bringing you the latest styles, current trends, and innovative technologies. For more expert information on window treatments, or for a Free In-Store consultation, give us a call today @ 403-547-4013. TIRED OF THE BOX STORE SERVICE, THEN COME INTO SHEILA’S WINDOW TOPPERS, our customers tell us that our prices are often the same or even lower. We have in-house trained design consultants & installers and have a great reputation in the Calgary window Covering industry. We can supply your Blinds, Drapery, Upholstery & Wallpaper needs. We make the purchasing process easy and ensure that you get the correct product within your budget by explaining the pros and cons of various treatments with you. Your windows will be measured & your window treatments will be installed for the best fit possible by a professional. We are your Hunter Douglas N.W. Calgary Window Covering Store specializing in window coverings, motorization, draperies, blinds, shutters, fabrics, drapery rods, upholstery & custom furniture. You don’t have to compromise service for price, we have blinds and shades with various price points to fit everyone’s budget!